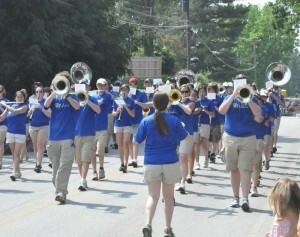 The Unionville High School Marching Band marches in the 2011 Kennett Memorial Day Parade. The UHS band joins Civil War and Revolutionary War re-enactors, bagpipers, fife-and-drum groups, vintage military vehicles, other local bands, fire equipment, and prancing horses—more than a thousand participants in all—to march through the bunting-draped streets of downtown Kennett Square. Organized by Bill Taylor and the American Legion Post 491, the event honors all who serve our country, and remembers those who made the ultimate sacrifice to preserve our freedom. The parade starts at Kennett High School at 10 a.m. and concludes with a ceremony and 21-gun salute at Union Hill Cemetery. The approximately 80 students in the Unionville High School Marching band participated in the BCS Championship Festival in New Orleans in January, 2012, and will perform at Walt Disney World in December, 2012.